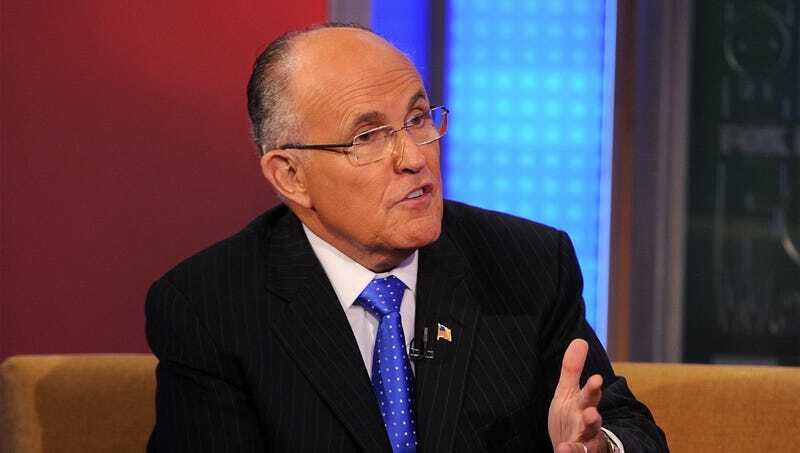 WASHINGTON—Speaking to Steve Doocy during an interview with Fox & Friends, President Trump’s lawyer Rudy Giuliani laid out the legal framework Monday that would allow him to remain on TV for the next couple years. “The president absolutely has the authority to delay meeting with [Special Counsel Robert] Mueller for several months as I continue to go on talk shows every week defending that decision,” said Giuliani, detailing the procedural steps that would provide a basis for the former New York mayor to appear on a wide swath of current event programs on a variety of networks well into 2020. “This is a complex case, and it could easily take 100-120 more guest bookings before we’ve even scratched the surface of the underlying legal doctrine. Once Mueller finally delivers his findings, it will still take a long time to untangle the relevant federal and state statutes during high-profile conversations with Sean Hannity, Anderson Cooper, and many other prime time hosts, all of which doesn’t even begin to account for the various radio, print, and online interviews that I will be undertaking nonstop during this period.” After facing pushback about his arguments, Giuliani reportedly defended his legal opinion by pointing out that he had specialized in this area for practically his entire career.